Watch the interview with Oscar Paul from Roundhouse Studios, London here! 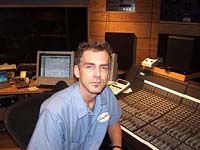 History: Classically trained in his native Iceland, Paul honed his production skills at the country's Syrland Studios for five years before moving to London in 1995. Oskar runs a writing and pre-production studio at Roundhouse. He produced S Club 7's No. 1 Smash UK and US hit 'Never Had A Dream' plus tracks on their next album and songs on Hear'Say's second album. He has spent the last two years writing and producing for, and with, new artists geared towards hooky pop material as seen by his success with bands such as Steps and the aforementioned S Club 7. However, Paul is keen to produce outside of the pop arena too, as he has done in the past with artists such as Seal, Depeche Mode and Curve. "I have been very lucky with the Pop Idol project coming through but I am not just a pop producer… I've always worked on more alternative projects as well, which I hope more people will get to hear in the near future," says Paul. Working with a constant stream of top name artists clearly isn't enough for Paul. He looks destined to continue his recent success as he has started a new partnership with former Cheiron writer/producer Jörgen Elofsson. As well as having hits with the likes of Britney Spears, Westlife and Boyzone, Elofsson also wrote and produced Will Young's 'Evergreen' single. Talking of the new partnership, Paul comments "This collaboration will involve us working together on a number of new and exciting projects". We can't help but think this duo will have their names attached to many more No. 1 hits. Current Credits: Oskar Paul has just had another number one hit with Pop Idol winner Will Young's single 'Anything Is Possible' which he co-produced with 90s singer Cathy Dennis. He has also been busy writing and producing forthcoming singles with Pop Idol's Gareth Gates and for fellow Pop Idol contestant Sarah Whatmore. His next productions are Claire & H for WEA, new Sony artist Luan Parle and Nana Mouskouri's daughter Lenou for Universal, plus he is writing songs with Ian McCulloch of Echo and the Bunnymen for his solo album and tracks with Ritchie Neville of Five and Emma Holland on Jive.